The printed word is indispensable to the advancement of civilised society and yet for almost a 1000 years, the printed book was available only to a minority. It is no wonder that the mass of people were illiterate until the mid 19th century. The earliest extant samples of printing are Buddhist charms printed before the year 770 AD. in Japan and the oldest book in existence is the Diamond Sutra Rol1,.16 feet long and 1 foot wide, found in a wall cave at Tunhuang in China, whose date corresponds to 16th May 868, 983 years had to pass before the genius of an Otley engineer, David Payne, in conjunction with his employer, William Dawson, evolved a principle which made possible a printing machine of the stop-cylinder type. The consequences of this revolutionary principle are incalculable in terms of spreading the printed word amongst millions of people and thus opening up the opportunity for a massive improvement in general education. A few milestones down these 983 years help to put the significance of the printed word into perspective. The earliest is the classical block printing of the Chinese. Between 971 and 983, the Tripitaka, a Buddhist canon, required 130,000 wooden blocks. In the year 1100, China had her first great inflation and block-printing was applied to paper money; thereafter, printing was established as a force in religion, philosophy, history and economics, but moveable metal types were not used until 1241 in Korea. It must here be said that no printing press was used for block printing, of which more later, and in fact China's main contribution to Western printing was the invention of paper. Western printing developed in fundamentally different conditions and lines and there is lack of incontrovertible evidence as to the invention of printing in the West. The invention is generally attributed to Johann Gutenberg who printed his famous Bible in Mainz, Germany in the year 1454. England's first printing press was set up in Westminster in the year 1476 by William Caxton, a man of independent means who discarded orthodoxy and printed in English, not Latin. During the period of the Reformation, printing began to acquire crucial power and the wealthy patrons of the previous century became scared enemies in the 16th century. III England the first 80 years of printing were 'free' and then for 140 years until 1695, it was severely controlled. From the days of Gutenberg to the beginning of the 19th century the printing press was a wooden structure. The impression was made by a lever and spindle which pressed a platen against the assembly underneath; after pulling the platen was raised and the assembly cranked out. Two men could produce some 2,000 sheets in a 10-hour day. Thus for 350 years since 1454 there was no development on the productive side of the printing art. By the end of the 18th century, the American and French Revolutions had freed the energies of millions and the art of printing had to change. During the first half of the 19th century there was a ferment of activity in the search for modernisation of the printing method and of the four elements of letter-press printing-type, press, ink and paper, it was the modernisation of the press itself which was sought in order to improve the output that alone could feed the starved minds of the enquiring masses. During the first 50 years of the 19th century, many engineers on the Continent and in America became involved in this incessant search, including experiments in the use of a cylinder and a flat bed which has great advantages over machines producing from two flat surfaces. But it was the inventive genius of an Otley man, David Payne, which made the real break-through into mass production of printed matter. His radical conception of the Wharfedale stop-cylinder principle in the construction of the printing press, revolutionised productivity and quality, and was the first machine to use the travelling bed which delivered the print without stopping the machine. Wharfedale stop-cylinder machines remained internationally pre-eminent for half a century; they are stIll in demand by Jobbing printers, printers of multi-colour process work; periodicals and magazines, and it should here be said that the. 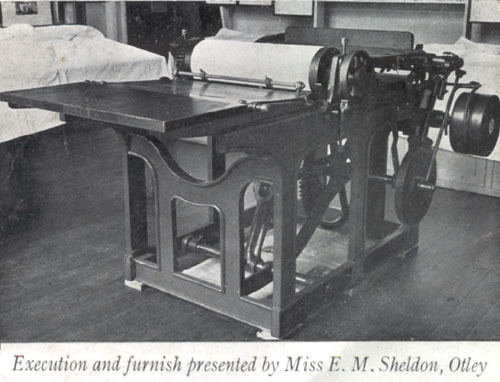 incessant 20th century demand for increased speeds of printing has resulted in the Dawson, Payne and Elliott Sheet Fed Rotary Letterpress Machine which has the phenominal performance expected of today's sophisticated machines. In 1850, David Payne was engaged by William Dawson who had commenced business 20 years earlier in Otley, as a joiner, Mr. Dawson had established a nation-wide reputation for the manufacture of equipment used by stationers and here one sees the influence of William Walker, an Otley printer who started business in 1811 and launched the first local newspaper. David Payne joined William Dawson at a time when the intense pressure for modernisation of the printing press was at its height and he was quickly seen to be a man of great ability and inventiveness. When a Mr. Soulby, who had been attracted by the fame of William Dawson as a maker of printing tools invited the latter to make his newly invented "Ulverstonian" printing machine, David Payne was at once seconded to the job. The "UIverstonian" was only a partial success, but in the possession of Mr. Stephen Payne, a great-grandson of David Payne, is an old book "The history and Antiquities of the Abbey of Furness" by Thomas Alcock Beck; 250 copies of this book were printed and in the fly-leaf of the copy held by Mr. Stephen Payne the following words are written. "Presented to David Payne as an expression of appreciation of improvements effected in the "Ulverstonian" printing machine by Stephen Soulby, Ulverston –1856". In attempting to remedy defects in the "Ulverstonian", however, David Payne's mind had conceived the principle which was to revolutionise the trade, and it is related that when the Payne family were moving house in 1851, his son was shown a drawing on the head board of a bed which was kept carefully covered; it was of the Wharfedale stop-cylinder principle and one imagines that David Payne spent sleepless nights as well as working days on this new conception. In 1859 the association between Soulby, Dawson and Payne ended, but in 1858 Mr. Dawson built the first machine incorporating David Payne's invention of the travelling bed with a stop-cylinder principle which he had first called "our own kind" although he did not take out patent rights. The first machine was in stock for a year before being bought by McLarens of Glasgow and the first newspaper machine by Mr. Milner of Lancaster. It was some years later that the title "Wharfedale" was applied but by then the machine had been abundantly copied both in England and abroad and it was calculated that at this time more than half the firms making them employed men who had worked for Mr. Dawson. The machine you now see in the Museum Room is a very early example of a Dawson Machine which embodies the Wharfedale stop-cylinder principle and was generously presented to us by the late Mr. James F. Stott whose family has long and important connections with the firm known as Dawson. Payne & Elliott Ltd., now a member of the Vickers Printing Machine Group. This brief pamphlet has tried to illustrate the great significance of the conception of the Wharfedale principle to the development of mass produced printing and its revolutionary consequence to the ever-widening mass circulation of newspapers, periodicals, books and educational literature. Indeed "The Wharfedale" printing machine you now see in the Museum takes a place in the field of printing alongside that of Stephenson's "Rocket" in the field of transport. Published by the Committee of the Museum of The Liberty of Otley, Printed by Wm. Walker & Sons (Otley) Ltd.